To be able to understand your feet is very important; it can also be very difficult if you don't know what to look for when it comes to problems. You've had the same feet for your entire life, of course they seem "normal." However, if you have flat arches, chances are your feet overpronate. With normal pronation, the outside of the foot makes initial contact with the ground when standing or walking. The foot will roll inward about 15 percent and come into complete contact with the floor. If you overpronate, the initial contact with the ground is the same, however, the foot will roll inward more than 15 percent . When this occurs, your feet and ankles are less likely to be able to provide stabilization for your body which makes them less efficient in absorbing shock. At the end of your step, you'll likely push off the ground using mainly your big and second toes. 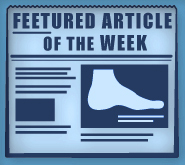 If your arches are causing you pain, visit Foot Doctor of the East Bay in San Leandro, CA. Don't wait for your feet to become so strained that it's painful to walk. Call (510) 483-3390 to schedule an appointment today.